Always hiring stylists with experience. Creative Hair Designs is a full service hair salon specializing in cuts, color, foils, and waxing services. 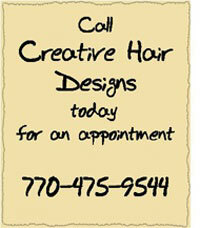 Serving North Fulton since 1984, Creative Hair Designs is owned by Debbie Beaver, a native of Atlanta. Creative Hair Designs offers a relaxed and friendly atmosphere. Experienced professionals, trained in leading edge styling methods and technologies, are focused on creating a custom look just for you. Women, men, and children are warmly welcomed. "Your hair is your best accessory—when it looks amazing, so do you..."
Creative Hair Designs is dedicated to providing creative and professional services customized to meet your unique needs and desires. Services include custom haircuts, blowout styling, special occassion hairstyling, conditioning, and waxing. Creative Hair Designs carries a diverse selection of only the finest professional products. Because each person is unique, your stylist is trained to analyze your hair and skin profile and recommend solutions specific to your profile and personal goals. Products include MATRIX, MOROCCAN OIL, REDKEN, and USMOOTH. Creative Hair Designs specializes in color services. Offerings include foils, single and double process, highlights and lowlights, and corrective color. Hair color products include REDKEN and KEUNE.